In our last few posts, we covered the changing landscape of abandoned barracks in Changi, including the new hotel at the old Roberts Barracks. In this post, we will continue our exploring of the other barracks around Changi Village - and we wonder what the fate is that holds for these remaining few vacant barracks. Changi remains one of Singapore's most serene and peaceful areas despite its violent past during WWII. Today, what is left are the empty buildings that stood during Singapore's darkest moments, lost in time but yet still holding on to the emotional baggage of the past. If anyone has the chance to step into these buildings or walk around to explore its surroundings, you will sometimes be able to sense the emotions related to the place - of prisoners, soldiers and patients of the barracks and nearby still empty OCH. But make no mistakes, this place is full of life in day time, you can see birds chirping away, beautiful green parrots flying from tree to tree, and plenty of kingfishers too! It is one of those places where time seems to stand still and nature is preserved to its original state as it was more than 60 years ago. One of the iconic buildings in Changi is this barracks situated right at the junction along the road along Cranwell Road and Netheravon Road. It is the first building that greets you when you enter Changi Village by the back way. Majestic despite its emptiness, it commands a view behold of any HQ or main building of a barrack. Walking along Changi village, I m greeted by the birds that never seem to stop flying around. This lonely kingfisher stands still on one of the old road markers along the quiet road up on Hendon road, where it is busy with plenty of cricket sounds and birds. Many mounds can be found all over the area and we wondered why? could they be filled with the bones of the old prisoners who died here? Their bodies simply being piled up by soil and dirt? Many questions often flood our minds when we notice strange or things out of the ordinary. while to some it may seem too crazy or just figments of our imaginations, or even wild ideas, the ability to think out of the box and ask questions have served us well - often allowing us to link certain clues together and find more clues to other things. Our eyes are often also vigilant towards things around that allow us to speculate. The inner room inside this building looks weird and stands out for us. There seem to be some decay or cloth of some sort within the interior. it looks a little out of the ordinary but unfortunately the many security cameras around these buildings stop us from exploring more. Up close picture of the opening from the window reveals it is likely a piece of rotten wood, possibly from a door inside the building. More strange things we notice, here, a window grill that is broken, and a rope that leads from it to somewhere. Could this be a break out or escape of some sort? A well thought out plan from a POW housed within one of these units during WWII? we never know but at least the buildings still leaves us some clues to ponder and fantasize about! Even windows that seem a little ajar stirs up our imagination. Why was it ajar? could there be someone trying to get out and trying to push the window open? could there still be someone inside?? some restless soul trying to communicate with us, even today?? It is so important to keep an open mind - for if u are in this paranormal industry, if your mind is tightly shut, then you are in the wrong hobby. Nearby at the end of the dead road, lies the back of OCH, now also cordoned off by security cameras and out of reach from budding investigators. What a waste. This place never fails to add lots of intrigue as well as excitement to any investigation. Other than abandoned buildings, Changi also is notorious for some crimes that took place here. During the murder at Downtown East where a youth was stabbed to death by another 'rival group', the murderers escaped to a chalet along the SAF chalet resort, before eventually being arrested by the police. 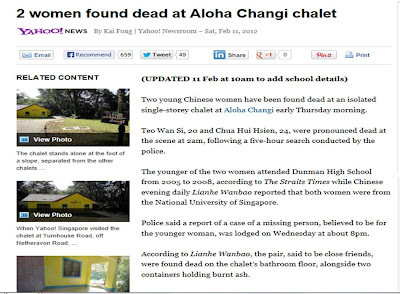 A year ago in Feb 2012, there was also a double suicide tragedy that happened in one of the holiday chalet unit at Aloha Changi. A pair of female friends, known to be a couple, committed suicide inside Chalet M, they were found in the bathroom, they had gassed themselves and died inside the unit. This double suicide gained a lot of coverage in the news, because of 2 lives killed and also the circumstances leading up to it. 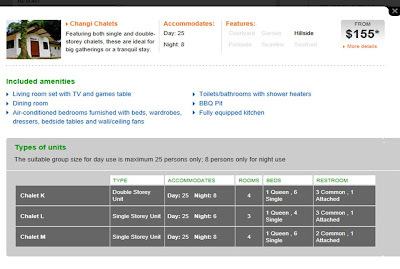 Lovers, disillusioned with life, pressure by another to die together, and even the chalet staff knocking on the unit hours before they died, to check on them and not knowing a tragedy was going to happen. We decided to visit the place, to see how the place was and to see if we can pick up some clues still left around the area, to try to make sense of this terrible tragedy. 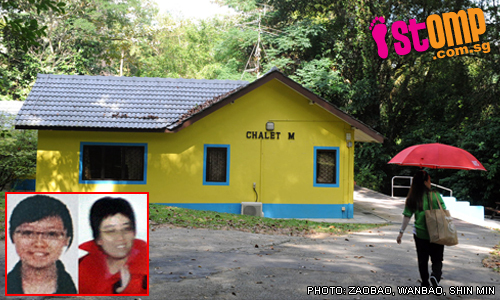 We found Chalet M quite effortlessly as it was the chalet directly beside a carpark - a carpark that is famous for cars and their occupants who make out. We wondered if any of the cars around that night could even anticipate or notice the happenings inside Chalet M. Well, probably not as they were probably too preoccupied themselves. The first thing we noticed was a condom on the grass patch beside the house! well, no surprise as we had known that this carpark is notorious for its running engines. Slightly disgusting to find that and luckily we didn step on it nor see an actual used condom. Phew! We walked to Chalet M. we noticed that its colors have since changed from the blue and yellow look to an elegant polished white look. It looked more classy. We started our exploration by walking around the chalet unit and doing a general ground recce of the place. Nothing much unusual that we found. looking into the unit, we saw a gap in the curtains and attempted to peep inside the unit. It was empty. We wondered if any unsuspecting guests might have stayed there after the deaths and if they had actually knew a suicide happened, will they still stay. Or perhaps this unit was left vacant after the incident and no one stayed. 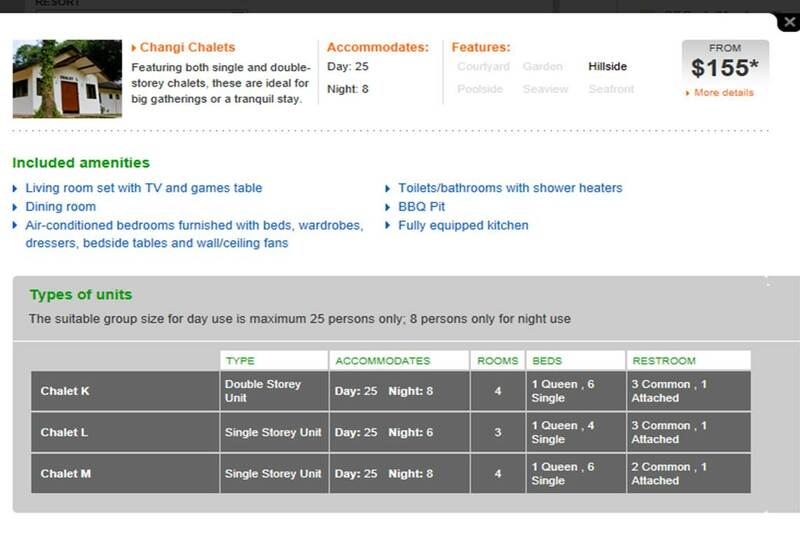 A check on the Aloha Chalet website reveals that Chalet M is definitely available for booking still, meaning that there is a high chance that unsuspecting guests, esp foreigners, may have actually booked the unit! Walking around, the area looks very well kept and clean. the BBQ pit is also cleared and neat. The cleaners have been doing their job! From the outside and around the surroundings, it is virtually impossible to tell that this place and unit had a tragic past that probably holds a lot of restless energies still. The doors were obviously locked - but peeping inside the room from the little gap in the window - we could tell that this unit is not occupied and there were no signs of people. the inside looked very clean and tidy too, but there was a strange greenish and reddish glow from the tiles and interior. As we walked along, we found another mound beside the grass patch. this mound is almost identical to the one we saw at Changi Barracks in the top picture. Each mound may have a story to tell because it is artificially created and we wondered what was this story? could there be something inside the mound? or simply a lazy gardener who decided to pile loose soil up? The doors were tightly shut and locked. no body inside. we refrained from knocking the doors or ringing the doorbell because we didn want to disrespect or disturb the inside, if there were indeed guests or restless souls. We noticed though, a little gap in one of the door panels, it was as if the doors were uneven and not well done, or perhaps it was created to let the air out in case another suicide plan of gas poisoning was done by someone else. 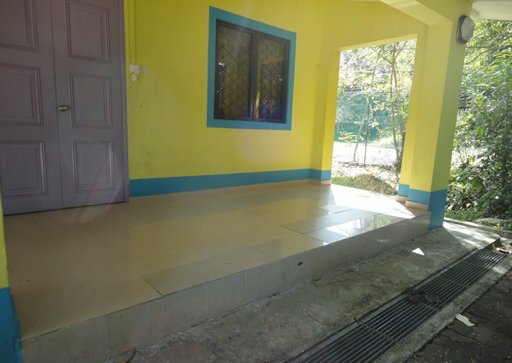 Strangely, when we found another picture of the actual Chalet M in 2012 when reporters visited the place days after the murder, what we noticed was that the door was exactly the same door as it is days after the suicide, but in this picture, the door panels were of the same height - there wasn't any gap at all, so this gap we found now is very deliberate indeed. It was a strange observation, but we couldn't find any concrete explanation but could only make guesses. We decided that other than the strange phenomena regarding the uneven door panel, this place is rather peaceful on the outside and nothing much strange or paranormal. We couldn't discount that at night though. Moving on, we continued to explore the areas around and was again greeted my buildings and animals. We noticed though that all the buildings were coated with fresh white paint, as if it was preparing for something new or a change. And we were right! we found workers starting on renovation of some sort and making some constructions in some of the abandoned barracks! looks like after many years of being vacant, it seems that there will be some developments coming along the way for this sleepy road!!! We wonder what will be the fate of these buildings- will it become a hotel? will it become a café or restaurant? will there be continued tales of the paranormal even after the development of this place? will this place be jinxed with the negative energies of the past and experience poor business?? We await the developments and are excited to see change yet slightly sad that the old peaceful buildings will no longer be serene. We will provide more updates of the developments when it is completed and bring to you more photos of the place!! So stay tuned!